Jagadish Ch. Roy, a forty eight years old small farm-holder of village Sakunibala in Cooch Behar district being exposed to skill-development trainings of KVK motivated to develop floricultural enterprise and started growing different flowers like Dahlia, Gladiolus and Marigold in winter of 2001. During the year 2001 he cultivated 0.1 acre of land with flowers like Dahlia, Marigold, Flax, Pitunia, Dianthus etc. By spending Rs. 3200 he had earned Rs. 5000 in that very season. A consistent area increase together with adoption of improved techniques for growing flowers over the seasons had made possible Shri Roy to become a recognized nursery man in his locality. His enterprise in the reported year is found sustainable and economically viable too to provide the extra earning for the maintenance of his livelihood. Now he is spending the money for the education of his children and he is the owner of three cycles, one plough, two bullocks, one milch cow and one cattle which reflects a vast improvement in his previous status and present status as a whole. Lastly, it is worth while to mention that the constant motivation, monitoring and valuable suggestions from the part of the KVK professionals make the enterprise sustainable, economic, profitable, viable, productive one. Revelation: Floriculture may be a viable option to sustain the livelihood status of the farming community in this region. Shri Kanchan Roy, a 31 years youth has become owner of two small, profitable enterprises namely floriculture and piggery. Kanchan, the resource poor farmer of the village Bararangrash in Cooch Behar district started the floricultural enterprise with gladiolus cultivation receiving critical inputs support from KVK, Cooch Behar in the year 2003 and at the end of season he had earned Rs. 1,800 by selling the gladiolus sticks. In 2004 he had cultivated 4 kathas of land with gladiolus corm and got Rs. 11,000 from the market and in 2005 from 10 kathas of land with gladiolus earned Rs. 35,000. So, the total venture of developing micro entrepreneurship on floriculture in this area reflects the growth of the viable enterprise at a row. Earning a good profit from the floricultural enterprise he invested the profit in developing another enterprise on piggery during 2006. Started with 4 indigenous Ghungroo pigs (3 female, 1 male) 28 yielded of which 24 piglets were sold @Rs. 1150 per piglet and 4 old pigs @Rs.4,500 which togetherly gave return of Rs. 45,600. The profit was very remarkable and outstanding because the initial investment to the enterprise was very less and the maintenance too. Now he is maintaining his family in a better way than before due to the extra income from these two enterprises at a row. Revelation : The composite entrepreneurship development can help the farming community to maintain the livelihood status in a better way and it paves the way of being socially esteemed and prestigious too. Gupinath Roy, a marginal farmer of Sukunibala village in Cooch Behar with 12 bighas of land had started the piggery enterprise in 2005 after getting motivated by the KVK professionals of Cooch Behar. With 3 ‘Ghungroo’ pigs, two female and one male, he earnd Rs. 18000. Rs.31000, 16000, Rs. 23000 during 2005, 2006, 2007 and 2008 respectively which reflected the positive growth of the enterprise at a row. A single initial investment but with gradual low maintenance cost with time with a very high return across the raring period proclaimed its great economic viability and high adoptability to the poor farmer. This is not merely a glimpse of piggery enterprise but also it reveals the way of augmenting the income for sustainable livelihood. Gupinath with the help of this enterprise is helping his family by bearing the educational expenditure of his brother and sister. Not only that but also the enterprise helps to possess the luxury assets of this family. Revelation : Innovative and venturesome farmer can achieve the desired status by developing piggery enterprise. Pratibha Sutradhar, a 34 years old woman in the village Sonari of the district Cooch Behar motivated by KVK Cooch Behar started to go with a small vermicompost unit. In 1200 sq m area consisting of 10 chambers she produced 25 MT vermicompost with a net return of Rs. 50000. It also generated 600 mandays directly and 25 mandays indirectly. The initial small unit of vermicomposting now transferred into a vermin-compost industry namely Vermi Agrotech under her proprietorship will annual outturn of 200 MT of vermicompost and net income of Rs. 3.4 lakhs per year. Merely a farm woman Pratibha now becomes an innovative entrepreneur with high social prestige and esteem. She is now the member of a NGO namely, KREDA. Her family is purely dependent on this enterprise in each aspects of maintaining sustainable livelihood. Revelation : Appropriate opportunity can be the strength to empower farm women. In the face of suffering of women artisans from different types of ailments during tea-plucking. Uttar Dinajpur KVK introduced an innovative tool ‘Finger Blade’ for tea plucking. The implement is made up of stainless steel and designed to fit the women fingers with the cut in the centre of the rings to adjust to the individual finger. Plucking of tea leaves using finger blades shown to give relief from finger injury, grip fatigue and of course to reduce drudgery. 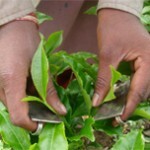 It also helps the tea plant to maintain the good health of plants as it reduces the pressure on roots. For large scale adoption of the tool, awareness building and skill-embedded knowledge dissemination programmes are bring continued at the grass root level. Bisu Tudu of Mahala village at Dakshin Dinajpur district has started the venture of Magur seed production during the year 2006 with the technical support from KVK Dakshin Dinajpur and State Fisheries Department. The technical suggestion and close monitoring by KVK make the enterprise economically viable and sustainable. A poor farmer with 1 bigha of land has become the owner of 8.5 bighas of pond area and 4 bighas of land area after 4 years of his successful journey. Initially he started the enterprise with 3 units and against the investment of Rs. 13500, he earned Rs. 31000. While during 2009 an earning of Rs. 69,000 by investing Rs. 20500 was his achievement. Bisu is now sending his children to the school and owner of the assets like pucca house building, motor bike, cycle and a pump. Such an enterprise not only helps him economically but also increases his social status in the village. Revelation : Magur seed production is an economically viable enterprise for the poor farmers of Dakshin Dinajpur district who has some pond area. 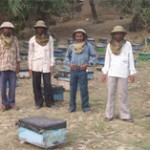 Rabindra Nath Sarkar, a twenty eight years old youth man of Beroil village of Dakshin Dinajpur district started bee keeping as secondary source of income of the family He has started during 2007 with one unit of the same with the initial investment of Rs. 1500 and earned Rs. 2000 from the same. Next year he set up 8 units with the investment of Rs. 4000 and earned Rs. 12000 which is a very good profit from the enterprise. From this profit he has purchased one cycle and a pump to get the market in a better way. Revelation : To be a resource reach farmer from resource poor one bee keeping is an economically, ecologically viable alternative of livelihood.